43, Jalan Scientex Jaya 6 INNOPARC, Taman Scientex Senai, 81400 Senai, Johor, Malaysia. 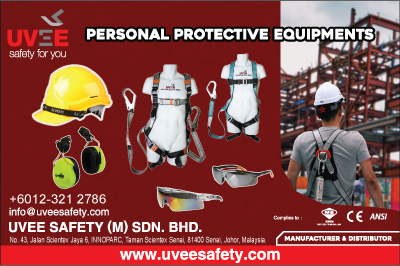 Uvee Safety is a Malaysian based manufacturer and distributor for safety and personal protective equipment (PPE) established since 2012. In Uvee Safety, the brand name – UVEE was created to significantly represent our identity and our present in personal safety industry where our core business direction is to focus in the development, manufacturing and marketing of quality safety and life saving products for a broad range of industrial users. Today, UVEE has launched its Industrial Safety Helmets, Safety Eyewear and Safety Vest to the markets. More comprehensive products will be gradually added to increase the safety coverage area of UVEE from the Head, Eyes, Ears, Face to the Body. To increase its market appearance, UVEE will continually introduce new idea to the safety equipment, for example; UVEE has introduced new Reflective feature to our Industrial Safety Helmet. The extra alert and visibility feature has created a factor for enhancing worker visibility in poor illumination environment and promote personal safety while working at night. In earlier, UVEE also launched its Pro II industrial safety helmet, being the first manufacturer to launch this full brim helmet in Malaysia.